Anika Manuel is a portrait and figurative painter from Cornwall. Her passion is for the flat, found image and its subsequent translation into painting. Having always had an interest in faces, Anika began copying from family photographs as a child, and to this day continues to capture realistic depictions of the human figure, although the subject has shifted towards the stylized and the celebrity. Working predominantly from found photographs and images in magazines, Anika re-presents these images within a new and exciting context. Recycling imagery is important to her general concerns, and she champions the undervalued and unexplored in a vibrant and instantaneous manner which the immediacy of acrylic paint lends itself to. Since graduating from the internationally renowned Chelsea College of Art and Design in 2011 with a First Class honors degree in Fine Art, Anika has had her work exhibited in numerous exhibitions and art fairs in the UK and was one of 12 artists chosen to take part in 20:12, an exhibition celebrating the Olympic games in which she was commissioned to paint a Team GB athlete. A highlight of her career was her first Solo show entitled “Dejavunik” which was held in the crypt of the acclaimed Mariners gallery in the beautiful location of St Ives and most recently, Anika has exhibited at the Affordable art fairs in Milan and Brussels as well as Stroke art fair in Munich. 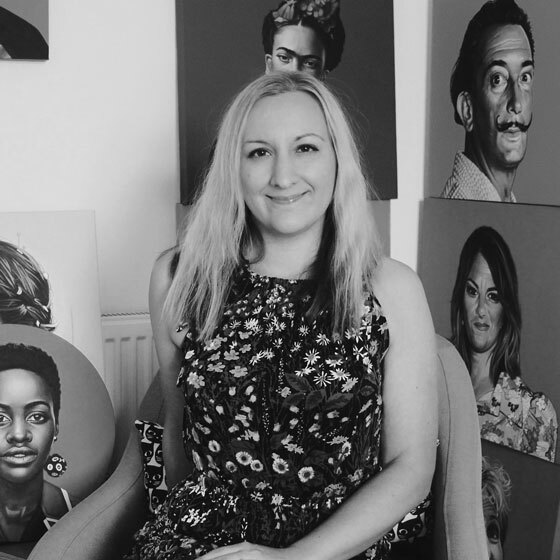 Her work has been featured in respected publications such as Cornwall Today and the Cornish Guardian, as well as Heat magazine and numerous online blogs. One of her more recent paintings “The Reader” was featured in The Independent and the Evening Standard.